Looking for some sweet handouts for your next corporate event, giveaway basket or your employees' personal use? Golf bags are the way to go. Our promotional golfing bags are useful, golf duffel bags are no exception. Whether you want a custom travel show bag, a stand bag or a Nike departure backpack with a logo, we've got it.. The Deluxe Open Faced Shoe Bag features foam bottom and front pocket and allows custom imprint for Brand Recognition. 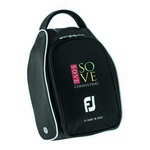 The FootJoy Nylon Shoe Bag features a zippered closure and fleece lining and allows adding brand logo to Promote your Brand. Our Golf Mesh Shoe Bag features front zip pocket and allows adding custom logo to create impressive Promotional Logo’d Products. Our Golfer's Travel Shoe Bag is suitable for golf and other sports activities and allows printing custom logo to create Custom Logo Products. Our Montana Shoe Bag features two breathing holes on top as well as bottom and creates the perfect Custom Logo Products with your brand logo. The Nylon Shoe Bag comes with imprint location on pocket and creates impressive Personalized Giveaways.